1. Describe the best sandwich in the world, according to you. Philly cheese steak. And this is not just according to me because millions (yes, I'm sure its millions) of people would agree with me. Oh, and it must be made in the Philadelphia or surrounding area. I've had them other places and they just aren't the same. 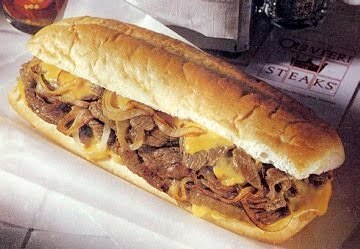 Ultra thin slices of steak with melted cheese and grilled onions on a hard hoagie roll. The roll is very, very important and where a good cheese steak often goes wrong outside the Philadelphia area. 2. Which inspires you more: a good conversation, a song, a book or a movie? I can find inspiration in conversations, songs and books. Off the top of my head I cannot think of any movies that were truly inspiring but there may be something out there. The Blindside? I'm just getting ready to start Radical by David Platt...pretty sure it's going to be inspiring. Surprise-I don't have ONE favorite. I like board games...a few favorites are Scattegories, Backgammon, Mexican Train Dominoes and Scrabble. 4. As you grow older, are you more or less patient with small children? I think I'm still really patient with young children but I guess we all become less patient as we get older. I'm probably not as patient with them as I was 20 years ago but I'm not impatient either. 5. Name one item you never let yourself run out of. Twizzlers. There's no wrong answers, right? 6. Do you agree with Tennyson's assertion "Tis better to have loved and lost than never to have loved at all?" 7. Name one National Treasure or landmark that you have visited. "a person, place, or object that is deemed to be of value to an entire nation, usually due to its cultural significance." If that's the case, how much time do you have? I could list hundreds just from my treks around England. I think for today I'll pick one of my favorite US treasures...Arlington National Cemetery. I've seen treasures the world over but few places move me more than sitting on a grassy hillside in Arlington. I've written about it before and you can read that here. 8. Which is more painful, to be disappointed in someone else or to be disappointed in yourself? Myself. It happens more often than I'd care to say. 9. What makes your kitchen uniquely yours? Hmmm...I'm not sure how to answer this one. Maybe its my recipe book with favorite family and friend recipes copied by hand and filed there. Maybe my collection of English and Italian pottery. Or it could be the digital photo frame that sits on the desk in my kitchen and circulates pictures of our family. It is uniquely ours and no one else would have something exactly like it. 11. What is your favorite or traditional picnic or bbq (cookout) food? 12. Name one leisurely activity you enjoyed over the Labor Day weekend. Again with the 'just one'. Sigh. I wrote a whole post on our Labor Day weekend here, however, if I must pick 'just one activity' I'll say a walk with my hubs and our pup in Central Park. I'm so glad I'm not the only one who isn't crafty! I am about to start reading Radical also....I am NOW thinking of picking up some Twizzlers (one of my fav candies) to nibble while I read, I do love peanut butter, but it does have a tendency to stick to the pages...love your Randoms today!! I love corn on the cob, too. When it is grilled, it is absolutely out of this world! We are going to finally get to watch the Blindside this week. I have been waiting for it to come in at the library. I've never been to Arlington, but I can imagine what a moving experience it would be. Your posts are like a breath of fresh air because you have traveled. Thanks for playing along. I miss stopping by here--I'm terrible at reading now--but working on it! You crack me up! I have the hardest time just picking one as well! Blessed are the indecisive, I guess. #1 Has me drooling all over my laptop, yum!! Unfortunately I have never had a "real" one since I've never been to Philadelphia. Not crafty either. I'm like Jill, I'm glad I'm not the only one out here that isn't. I am about to start reading Radical also....I am thinking of picking up some Twizzlers (one of my fav candies) to nibble while I read, I do love peanut butter, but it does have a tendency to stick to the pages...love your Randoms today!! It's not called Des Moines steak for a reason. I am so with you on the roasted corn AND the not being able to pick 'just one'! Have you ever been to the American Cemetery in Cambridge, England? That brought such powerful feelings in me, as did our own Arlington National Cemetery. 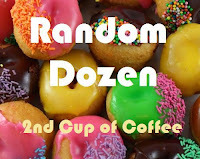 As you could tell from reading my blog I struggle with the just one and wasn't very successful with that. A nice walk with the hubs and pup! That would have been a nice thing for the weekend. I'm glad that I'm not the only non-crafty one out there! Thanks again for visiting! :) Loved your answers. I don't like sandwiches, but that is just WRONG to put there picture up, I am drooling! Can I get a side of pickles please? Oh Arlington is a wonderful place. Actually most of the monuments in Washington left me in awe! At 15 Arlington overwhelmed me. I still am moved by the site. How beautiful and how sad it was. Whew. I am so glad I am not the only one who has trouble picking out just one answer. It is so hard! My number 9 would be the sink full of dishes. Well, first of all it IS Craninum!! I knew someone would know. I love Twizzlers AND roasted corn on the cob. I am gonna have to rib CQP because I am from Des Moines, and while we do a lot of thing great Philly Cheesesteaks are probably not among them. I so want to go to Arlington I must go read your post. You walked in Central Park? Do you live in NYC or were you just visiting? I'm jealous!!! Enjoyed your answers...hope you'll check mine out! You are most definitely crafty so I have to disagree with number 10. "in a word, no." Love it and ditto! We have a place called Philly's Best and they are delicious. I forgot about that when I answered. Great answers. Hope your week is going well. Arlington...a must see for every American! Enjoyed your answers! I love all games too! and Twizzlers are my favorite candy!!! I am not crafty either! Loved reading more about you, Joyce! Great answers! I looked up Radical....now I've got to read it. Thanks!